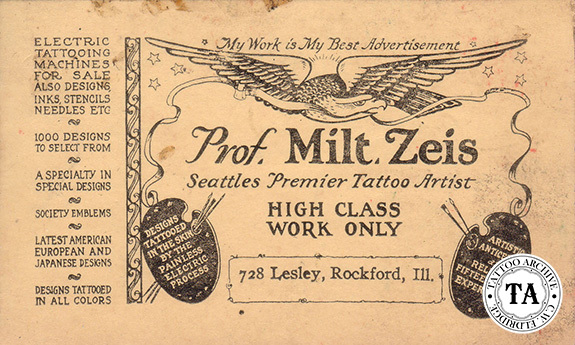 Milton Zeis was a man of many talents: businessman, commercial artist, performer, author, publisher, tattoo supplier and tattooist. Zeis was born in Rock Island, Illinois, a small town on the Mississippi River. The river was to have a profound impact on Zeis' destiny. His fascination with tattooing came at the age of 9 when his father took him to a riverboat show that played on the Mississippi. It was here that he first saw tattooing. As a teenager Zeis grew weary of the small town atmosphere and began the travels that would further shape his future. 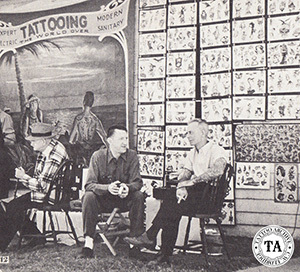 From the mid 1910s to the early 1930s he learned much about the tattoo business. He employed that knowledge in a mail order business known as The Zeis Studio and located his business in Rockford Illinois. Zeis worked out of the basement of his home, operating a supply business on one side and a tattoo shop on the other. For nearly 20 years he sold flash, pigments, machines, and other supplies. Flash has always been a major part of any supplier’s business and Zeis offered black and white sheets and was one of the first to offer colored flash. During the 1940s Zeis, using his expert skills as a commercial artist and created more interesting and colorful catalogs than were previously available. 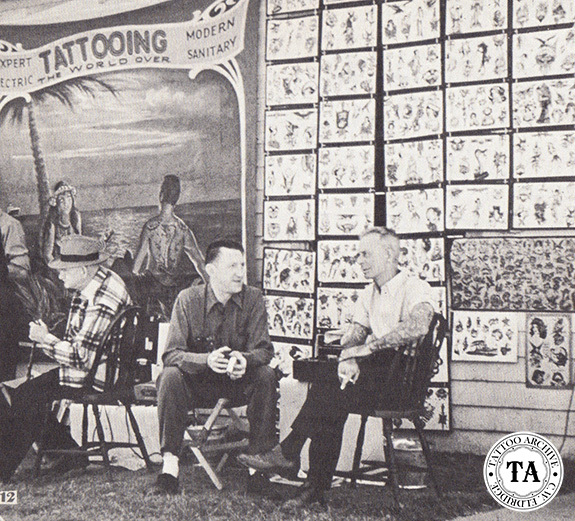 Tattooing the World Over, a contemporary and historical advertising magazine was first published in 1947. The Zeis School of Tattooing and its related course were a natural extension of the studio and the supply business. First published in 1951, the Zeis course included 20 lessons and sold for $125.00. Adlai Stevenson, then Governor of the state Illinois, accredited the course as a home study program. By this time, Zeis was a well-respected member of the community and the Zeis Studio had become world famous. He was active in tattoo circles and founded The International Tattoo Club. From that first riverboat experience as a child, Zeis' interest in show business never waned. He was associated with many circuses and carnivals while on the road. In his later years, he created the clown character, "Uncle Miltie," and was director of the Shriner's "Klownabains." It was in 1972 while preparing for a performance as "Uncle Miltie" for the Fireman’s Ball, Zeis suffered a fatal heart attack. Thus ended the career of one of the tattoo world's great legends.